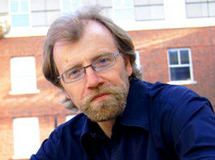 George Saunders G’88, one of this year’s most celebrated American writers, will kick off Syracuse University’s Fall 2013 Raymond Carver Reading Series at 5:30 p.m. Wednesday, Sept. 18, in Gifford Auditorium. A question-and-answer session will precede the reading from 3:45-4:30 p.m. The event is free and open to the public. Parking is available in SU’s paid lots. Saunders, who teaches in the Creative Writing Program in The College of Arts and Sciences, was chosen this spring for the 2013 PEN/Malamud Award, which recognizes the “body of work that demonstrates excellence in the art of short fiction.” The award honors the late writer Bernard Malamud. Saunders will read at the Folger Shakespeare Library in Washington, D.C., Friday, Dec. 6 as part of the award presentation. On the heels of the Malamud Award, Saunders was named to the 2013 TIME 100, the magazine’s annual list of the 100 most influential people in the world. The 10-year-old list recognizes the activism, innovation and achievement of the world’s most influential individuals. This summer, Saunders’ May speech at The College of Arts and Sciences’ 2013 convocation ceremony, went viral. “Here’s something I know to be true, although it’s a little corny, and I don’t quite know what to do with it: What I regret most in my life are failures of kindness,” he said in the speech. His advice to the graduates: “Err in the direction of kindness.” Random House will publish “Congratulations, by the Way,” an expanded version of the speech as a book in spring 2014. Saunders has won the National Magazine Award for fiction four times. In 2006, he was named both a MacArthur and Guggenheim fellow. His fiction and nonfiction has appeared in publications including The New Yorker, GQ, Harpers and Esquire. In addition to “Tenth of December,” his books include “CivilWarLand in Bad Decline” (Random House,1996), “In Persuasion Nation” (Riverhead Books, 2006), “The Braindead Megaphone” (Riverhead Books, 2007), and “Pastoralia” (Riverhead, 2000). The series will continue with the following authors. All readings begin at 5:30 p.m. in Gifford Auditorium. Question-and-answer sessions are from 3:45 to 4:30 p.m. Further information is available by calling 315-443-2174. Oct. 9: Etgar Keret, a popular Israeli writer of short stories whose work has appeared in publications including The New York Times, Le Monde, The Guardian, and The Paris Review; among his books is “Four Stories” (Syracuse University Press, 2010) and “Suddenly a Knock on the Door: Stories” (FSG, 2012). Oct. 16: David Baker, a poet whose books include “Never-Ending Birds” (W.W. Norton, 2009) and “Talk Poetry, Poems and Interviews with Nine American Poets” (University of Arkansas Press, 2012). He is also the poetry editor of The Kenyon Review. Nov. 13: Stephen Dunn G ’70, winner of the 2001 Pulitzer Prize for “Poetry for Different Hours” (W.W. Norton, 2000). His poetry collections include “Here and Now: Poems” (W.W. Norton, 2011) and “What Goes On: Selected and New Poems 1995-2009” (W.W. Norton, 2009). Nov. 20: Cheryl Strayed G ’02, author of The New York Times bestselling memoir “Wild: From Lost to Found on the Pacific Crest Trail” (Knopf, 2012), “Tiny Beautiful Things: Advice on Love and Life From Dear Sugar” (Vintage Books, 2012) and the novel “Torch” (Houghton Mifflin, 2006). Dec. 4: Jane Springer, a poet whose books include “Dear Blackbird” (University of Utah Press, 2007) and “Murder Ballad” (Alice James Books, 2012).